Mt.Ohsabi, 3D Manufacturing : 3D JUMBO LAND : JUMBO CO.,LTD. Mt.Ohsabi is located in Tochigi, Japan. It peak is 1908m high. The coordinate of the city is 37°03’49”N and 139°50’40”E . 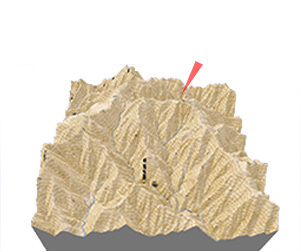 We produce the object as following scale model, the edge of horizontal plane is 10cm square against actural 7.5km around the peak, but z-axis is twice than actual size. We are also acceptable for your own purpose, favorite customization and so on.